Just to refresh the minds of SMART's 70 million subscriber in the Philippines. 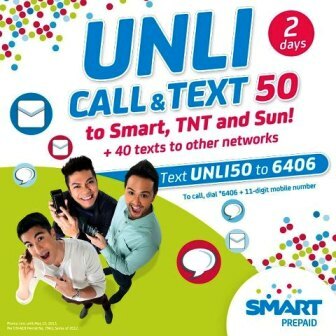 Lets share some unli call and text promo, which is widely used to save some bucks. So how to register for SMART unlimited call and text promo? First of, lets make this post long and talk about the benefits first by subscribing in such promo. Save money of course, instead of paying 7 pesos per minute call and 1 peso per text, why not make your 50 pesos 2 days unli call and text, unless your too lazy to type the codes in your keypad, or touchscreen. Another benefit, sometimes you ask, how can I text to other networks? Just don't sweat on that, cause the promos that I'm going to share, comes with free text to other networks, such as Globe, TM, etc. Enough of the chitchat, and share this code by SMART Communication. Unlimited call and txt to Smart/TNT/Red subscribers. Unlimited call and text to Smart/TnT/Red subscribers. Unlimited call & text to Smart/TNT/Red subscribers. To call: dial *6402 + 11 digit mobile no. What are you waiting for? Avail the promo now, and choose the promo that fits your need.